ACTION is a partnership of locally-rooted organisations around the world that advocate for life-saving care for millions of people who are threatened by preventable diseases. Working as equal partners to bring together efforts across borders to increase investments and build political support for global health. 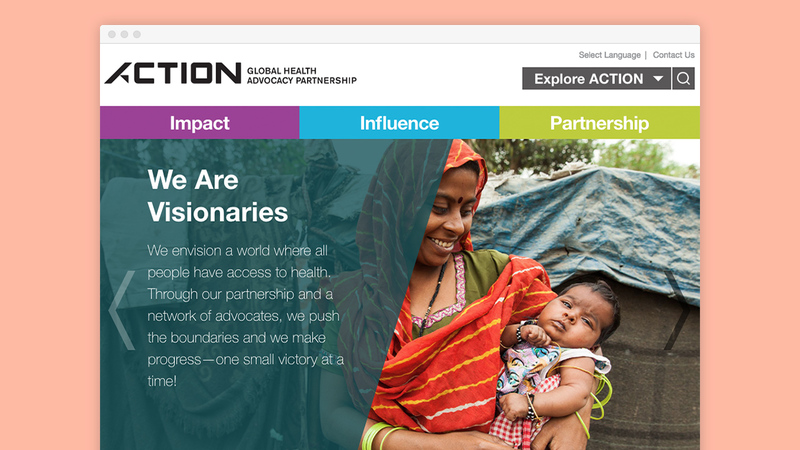 Over the last six years alone, ACTION partners have helped bring $3 billion to the Global Fund to Fight AIDS, TB and Malaria; $5 billion for Gavi, the Vaccines Alliance, to support poor countries in immunising half a billion children; and $3 billion for the long-neglected fight against undernutrition. Warble Media was contracted by Moiré Marketing Partners to build the front-end and content management system integration for this website. This partnership proved to be successful in delivering such a high-profile website on time and within budget.